I’m beginning to experience something my parents and their generation never got to experience: watching new episodes of a TV show from their childhood with their children. Sesame Street is alive and well in this house, just like it was in mine when I was a wee one and I am SO EXCITED, but not in a Jessie Spano way and more like an Elle Woods way. Everyone who’s met Madelyn knows that she’s a squirmy one. They know this because they’ve needed an inhaler from babysitting-induced asthma. Girlfriend does not sit still. She is so curious and grabby and move-y that she is not one to stop and smell the roses. She’ll plant ’em and water ’em and pick ’em, but stopping and smelling ’em? No. Not our Madelyn. I’ve gotten fairly used to this, but it took a while since I, myself, am not a mover and a shaker. I can just sit and watch things for long periods of time. 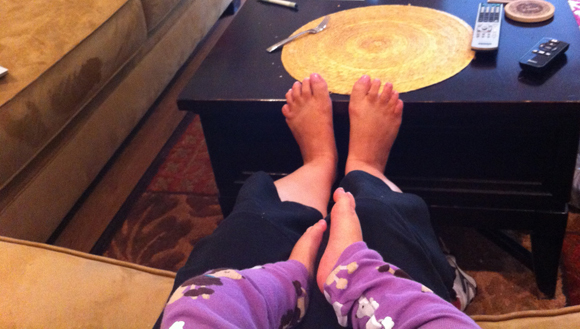 I’ve learned to up my stamina and keep up with Madelyn. But once in a while, I am exhausted and I just need a little cuddle time with my non-cuddler. 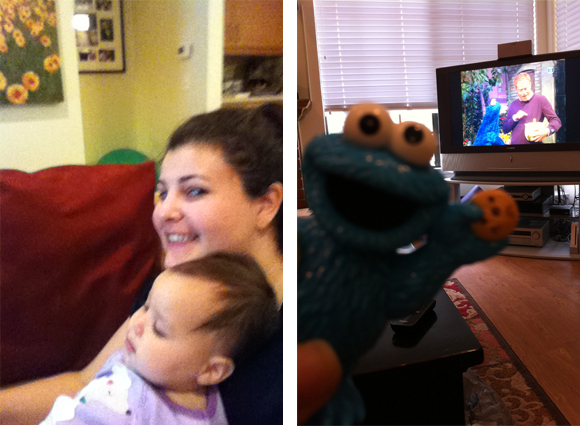 I finally figured out what would do the trick: Sesame Street! For the record, we are not leaving our kid in front of the TV and letting it raise her like Nana did with Peter, Michael, and Wendy Darling (seriously, what were those parents in Peter Pan thinking, letting a dog raise their kids?). No no, Mr. Sony is not a replacement for my mothering. But a handful of minutes of colorful and safe kids’ programming seems like a healthy and acceptable method of relaxing on the couch. I DVRed a few episodes so we’d have some relaxation inventory and I was so excited to cuddle with my baby and watch my buddy ol pals, Big Bird, Snuffy, Cookie Monster, Grover and Telly all come to life for Madelyn. And I was curious to see how Gordon and Susan and Maria looked after all these years. My oh my, has Sesame Street changed since my day. Ohmygosh I just used “my day.” I am officially old. The intro song — you know, “Sunny days, keeping the clouds away…” is basically gangsta rap now. After the first few seconds, I half expected a hologram Grover to show up and finish the song. There’s like a steady beat and some synth and it’s all very … not what I grew up with. And there are so many new characters! Hardly any of the guys from my old crew were featured on the show we watched. Elmo made an appearance, but he was animated! Pssshhh. Cop out. And Oscar was on for a while, so that was refreshing. You know things are backwards when Oscar is refreshing. But Gordon? Daaaay-aaaamn. Gordon looked GOOD. That guy did not age at all. No other humans showed up and in one whole episode, Big Bird and Snuffy were totally absent. In their place, an orange monster named Murray and a magical fairy named Abby played big parts. Cute, but… not yo mama’s Sesame Street. Madelyn didn’t know the difference, though, and was definitely fixated. I was getting sad that my nostalgia wasn’t going to get satisfied in this new-to-me incarnation of Sesame Street. Madelyn was loving it, but I was looking forward to us sharing something from my past. A few weeks ago, I even bought her these plastic figurines that fit perfectly in her hands (and her mouth) and she loves to play with them. When I was at the store, I had a few different options, but I chose the two that I knew among the characters I didn’t know: Cookie Monster and Telly. When they finally showed up on TV at the end of the show, I was so excited! Madelyn must’ve heard it in my voice and clapped for me! I got up and retrieved her Cookie Monster and Telly figurines and I wonder if she was confused about holding them in her hands and seeing them on TV at the same time. She watched intently and my heart flooded! Today’s episode was brought to us by the letter Q and I know it sounds a little quirky, so please don’t be quick to judge, but spending quality time watching Sesame Street on a quaint morning under a quilt with my baby girl made me feel like quite the queen!